In first grade, I tried my hand at writing. I imagined all sorts of wild tales about bears traveling the world and unicorns who fell in love. My first grade teacher, Mrs. Kosinksi, nurtured my creativity and declared I would be a writer one day. I remember vividly the day in fifth grade when the Chicago poet Gwendolyn Brooks came to share at my school. Her words sang to me in deep bluesy notes and made my home town come alive. I knew in my heart I wanted to be a poet one day. In high school, I signed up to write for the sports section and eventually became the editor of the school newspaper. I was invited to be a part of a program put on by the Chicago Tribune for high school students who were interested in pursuing journalism as a career. Journalism seemed like a sensible way to follow my passion for writing. I applied to colleges and settled on Calvin College in Grand Rapids, Michigan with a major in English and minors in Journalism and Spanish. I quickly found my way to the newspaper office at Calvin and the editors plugged me right into reporting and editing. My junior year I took on the role of editor-in-chief and got my first opportunity to write editorials, proposing change on campus and sharing my passion for hot button issues like multiculturalism and environmentalism. My senior year of college I boarded a plane and landed in San Jose, Costa Rica, where I spent the semester studying Spanish, Latin American history and volunteering with various organizations. That experience opened my heart to the world of travel and the complications of survival for people living in poverty. I graduated from Calvin in 1999 and began the Pulliam Journalism Fellowship with the Arizona Republic newspaper. That summer I landed my first job and moved to the diverse central San Joaquin Valley in California. As a features reporter for The Fresno Bee, I had many adventures as I covered everything from arts and entertainment to home and garden to faith and values to books. I tried out salsa dance lessons and a weekend kayak adventure and wrote about them. I started a series about trends among Generation X and Y. Writing for The Bee led me to a job teaching at Fresno Pacific University. I started out as an adjunct professor teaching journalism and sharing my love for storytelling with students. Later, I had the opportunity to teach Composition classes, breaking down the nuts and bolts of good writing for students. In 2001, I edited a poetry collection called MOSAIC VOICES: A Spectrum of Central Valley Poets. Some of my own poetry was also featured in the collection. The poets included were all invited by the Fresno Jazz Society to perform their work to musical accompaniment. The words were dancing for me once again. During the summer of 2001, the world of travel was reopened for me. I signed up for a short-term mission trip with a group from my church. We traveled to Haiti to put on a track and field sports camp for impoverished kids living in the northern mountains. I fell in love. I knew Haiti would one day be my home. I also met Ericlee Gilmore, who would later become my husband. After that trip, I went home and decided to take a leap of faith. I quit my “dream job” reporting for the newspaper and decided to move to Haiti to teach English. While there, my writing career took a different turn. 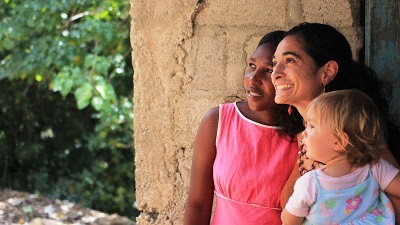 I wrote regular emails home to my supporting friends and family depicting life in Haiti. I started telling the stories of the people I met and the cultural nuances I encountered. After my stint teaching in Haiti, I decided to return to Fresno. I connected with a publisher who employed me to begin work on a multicultural cookbook project. I poured myself into that project but in the end the publisher and I parted ways. This was my first experience “failing forward.” I stepped away from my book contract but stepped forward into a new calling of writing books for children. The following year I married Ericlee. His grandparents were pioneer missionaries in Haiti in the 1940s and we talked of traveling back there regularly. After we got married, Ericlee encouraged me to pursue my writing dream to write books for kids. I began a Masters of Fine Arts program at Hollins University in Roanoke, Virginia in Children’s Literature. We lived in Fresno during the school year so my husband could teach, then traveled to Virginia during the summers so I could take classes and work on my thesis. For one of my master’s classes, I wrote the manuscript for my first illustrated picture book, CORA COOKS PANCIT. This book was very personal for me. I grew up cooking in the kitchen with my mama and grandmas and aunties. 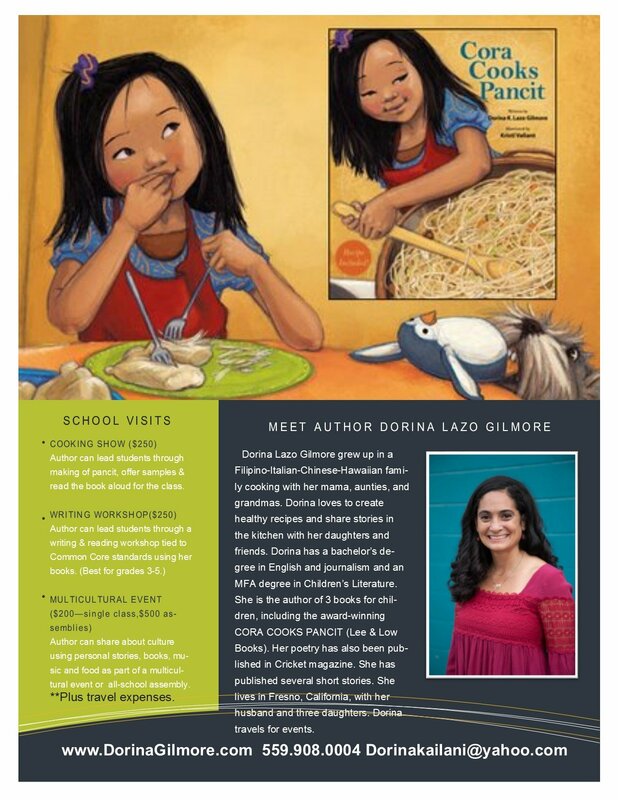 This story tells about a Filipino girl who learns the recipe to her family’s favorite noodle dish and uncovers some family history in the process. Some of the interviews I had done for my original multicultural cookbook helped shape this book. I believe recipes are also a kind of story, a narrative of ingredients and traditions. I share recipes on my blog to invite people to my table. 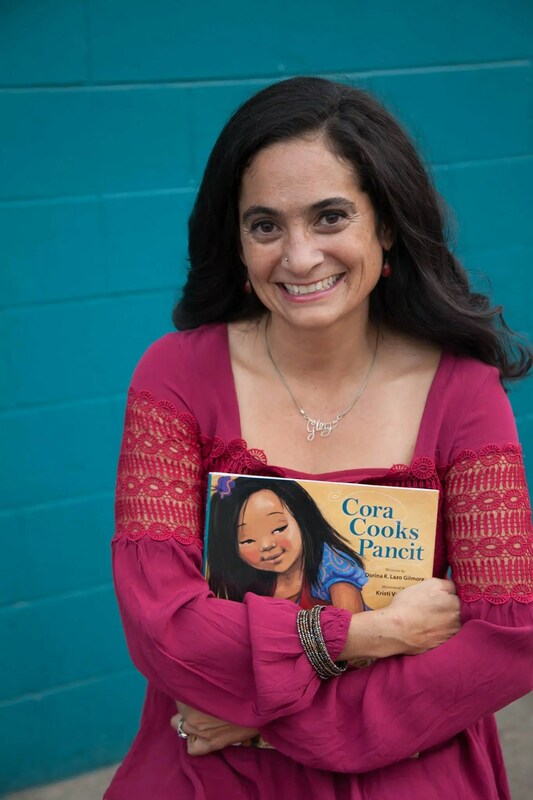 CORA COOKS PANCIT won the Asian Pacific American Librarian Association’s “Picture Book of the Year” in 2009 as well as being chosen for the Cooperative Children’s Book Center’s list of top books for 2010 and the “Picture Book of the Year” by One Book, One San Diego in 2014. This book has opened many doors through the years to meet children across the United States and to present in classrooms from Fresno, California to Chicago, Illinois and back to San Diego, California. I love to travel and hear how kids (and adults!) connect with the characters and experiences in my books. My husband, Ericlee died from melanoma cancer in September 2014. Of course, that is part of my story I never would have written for myself and my three young daughters. These past few years we have been learning together how to navigate grief and how suffering informs each of our characters. I recently married a long-time friend and supporter, Shawn Young. He is one of my best encouragers and most honest critics. Today, I’m still writing picture books for kids, blogging and now speaking about my journey at women’s events and retreats. I just finished writing a 10-week Bible study called Glory Chasers, and I’m working on the companion book about finding God’s glory in unexpected places. I’m an active member of the Society of Children’s Book Writers and Illustrators and Hope*Writers. I also am a huge supporter of the We Need Diverse Books movement. When I’m not speaking and sharing stories with students, I’m running marathons, creating healthy recipes and reading books with my three daughters – Meilani, Giada, and Zayla. My dream is to make words dance for them the way my mama and my mentors did for me.